by Mano, M. Morris R.; Ciletti, Michael D.
For introductory courses on digital design in an Electrical Engineering, Computer Engineering, or Computer Science department. 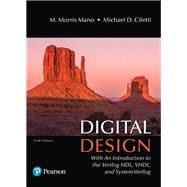 A modern update to a classic, authoritative text, Digital Design, 5th Edition teaches the fundamental concepts of digital design in a clear, accessible manner. The text presents the basic tools for the design of digital circuits and provides procedures suitable for a variety of digital applications. Like the previous editions, this edition of Digital Design supports a multimodal approach to learning, with a focus on digital design, regardless of language. Recognizing that three public-domain languages—Verilog, VHDL, and SystemVerilog—all play a role in design flows for today’s digital devices, the 5th Edition offers parallel tracks of presentation of multiple languages, but allows concentration on a single, chosen language. M. Morris Mano is an Emeritus Professor of Computer Engineering at the California State University, Los Angeles. His notable works include the Mano Machine, i.e. a theoretical computer that contains a central processing unit, random access memory, and an input-output bus. M. Morris Mano has authored numerous books in the area of digital circuits that are known for teaching the basic concepts of digital logic circuits in a clear, accessible manner. His books for the introductory digital design course, Logic and Computer Design Fundamentals and Digital Design, continue to be two of the most widely used texts around the world. Michael Ciletti is an Emeritus Professor of Electrical and Computer Engineering at the University of Colorado, Colorado Springs. An early advocate of including HDL-based design methodology in the curriculum, he pioneered and developed the offering of several courses using Verilog, VHDL, FPGAs and standard cell based hardware implementations for design, testing, and synthesis of VLSI devices. His consulting work has ranged from processor design to providing expert witness testimony in cases involving HDLs. He has developed and presented courses for industry in The United States, Asia, and Europe. His widely-adopted textbooks have promoted the use of the now-standard Verilog HDL and encouraged adoption of HDL-based design practice in logic design and computer science curricula. Ciletti resides in Colorado Springs, CO, where he pursues a strong interest in landscape photography.